This is the fifth installment in our series on American hoppy ales that began on July 28. 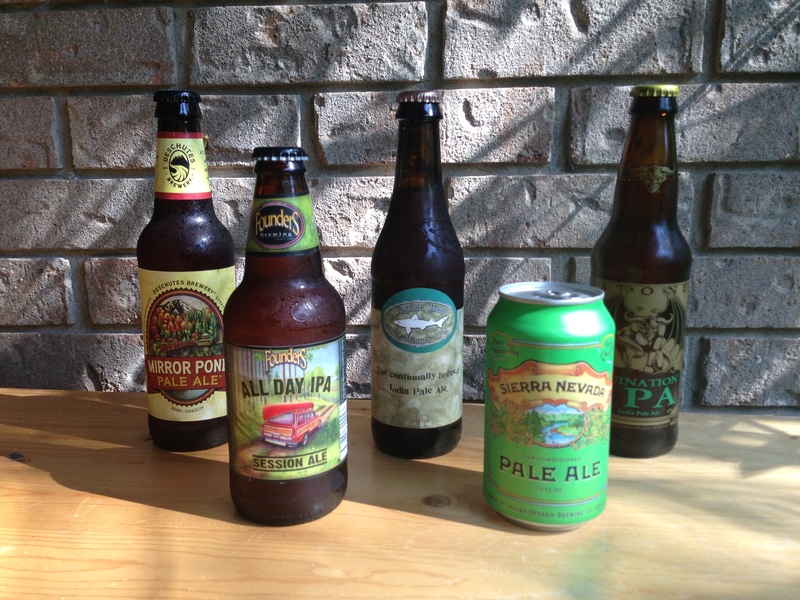 These hoppy ales are dominated by American hop varieties. American pale ales, American IPAs and dIPAs are a showcase for American hops. (There are, of course, pale ales, IPAs, etc that are brewed in the US that use British or other hops, but for this series we’re sticking to discussing “classic” American-style hoppy ales.) There are many hop varieties to choose from, but several merit discussion as they are used frequently in these beers. See also the chart at the end of this article for the statistics on a variety of hop strains that work well in APAs, IPAs and dIPAs. Cascade hops are among the most widely-used variety in US craft brewing. This hop — which is described as floral and citrus-like, with a hint of grapefruit — can be found in a wide variety of classic American hoppy ales, with the obvious example being Sierra Nevada’s Pale Ale. Cascade works well as a flavor, aroma or dry hop and, although not very high in alpha acids, can even be used for bittering in an APA. Cascade can be used alone or paired with any of the other floral/citrusy American hops and also piney hops like Simcoe. Cascade is high in cohumulone, the alpha acid with the harshest edge to it. Some brewers use low-cohumulone hops (such as Amarillo) alongside it to soften the cohumulone “bite,” especially in very bitter beers. Three other hops that start with the letter “C” show up frequently in hoppy American ales. Centennial was bred as a “super Cascade” variety and is similar in it’s overall flavor and aroma, but higher in alpha acids and lower in cohumulone. Centennial is very versatile and can be used for bittering, flavor, aroma or dry hopping. Chinook is a high-alpha variety that has a very distinct piney/grapefruit (for lack of a better description) character. It is most often used for bittering. Columbus (also called CTZ to stress that it is the same variety as Tomahawk and Zeus) is the final classic “C” hop. A high-alpha variety, it has a pungent earthy/”dank” aroma that is very distinct. Both Columbus and Chinook hops are fairly high in cohumulone and single hop beers brewed from them are typically too “aggressive,” especially for casual fans of hoppy beers. Some die-hard hopheads like this “in your face” bitterness, though. There are other hop varieties that begin with the letter “C” — Cluster, Crystal and Challenger, for example — but they don’t fit the floral, citrus-like nature of the other C-hops. Amarillo is a popular American hop variety, and is another with a floral and citrus aroma and flavor. It is similar to Cascade, but where Cascade has it’s typical “grapefruit” note, Amarillo has a strong tropical fruit character. Amarillo is most often used as a flavor, aroma or dry hop, although it can be used for bittering as well. It pairs well with Cascade, Centennial and the other “C” hops because its overall character is similar. And because it is low in cohumulone, it can be used to lower a beer’s cohumulone content. Ahtanum is another floral, citrusy American hop that works well for flavor, aroma or dry hopping. Although it has excellent flavor, it’s is moderately high in cohumulone. Many high-alpha hop varieties have been released in the past 15 years, and many of these are also low in cohumlones, so they make excellent bittering hops for beers that use a lot of high cohumulone “C” hops late in the boil. Higher alpha hops means more alpha acids in your kettle, with less other plant material to contribute tannins or other vegetal matter. Warrior, Horizon and Millenium are three with high alpha acid content, but low cohumulone. Simcoe is high-alpha variety with a distinct “piney” character. It is used frequently as a bittering hop, but can also be used for its flavor. It pairs well with any of the floral/citrus hops. Summit is another high-alpha variety with an interesting flavor and aroma, described as spicy and earthy. It is usually used as a bittering hop. And finally, Citra is a new hop variety that many brewers are excited about. With a citrus and tropical character, it pairs well with other classic American hops and also does well on its own. This is merely some of the more commonly used, and promising, hop varieties used in hoppy American ales. Even “classic” hoppy american ales — those that prominently feature floral/citrus American hops — may contain other neutral, noble or other hops from England, Germany, Czechoslovakia or New Zealand. Tomorrow, I’ll begin discussing hopping methods, beginning with hops added in the boil. 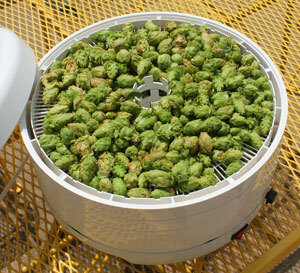 Homegrown Cascade hops drying in a food dehydrator. Here are some of the most frequently used hops found in APAs, IPAs and dIPA and some newer hop varieties that show promise in these. The descriptions are condensed from the hop merchants. “Interesting” is a good way to describe Summit, if by “interesting” you mean “onion”. Summit has a great tangerine thing going on, but then I’ve always gotten a savory onion/garlic/asiago note along with it. Great for a cooking beer, not so much for drinking. Summit seems to be one of those food items that some people perceive differently than others. Like cilantro tastes soapy to some. Summit tastes citrusy to some, oniony to others. Glad you liked it. I don’t have any plans to make a list like the one your describe, but it’s a good idea. I’ll keep it in mind. Now I’m only have East Kent Goldings hops, so I’ve to buy other. Maybe the next small batch I do it will be with EKG for bittering and Cascade or Amarillo for flavour and aroma, I’d like some “fruit” aroma in my next beer, but with not too much IBU’s. Won’t hops from Czechoslovakia be a bit past their prime? Yes, I know. Czech Republic. Old habits die hard.